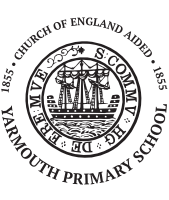 Yarmouth Church of England Primary School encourages and supports the whole school community to travel more actively and sustainably where possible. Studies show that travelling actively can help develop physical and mental well-being, social interaction, independent travel skills and good road sense. This helps ready our children for when they leave Yarmouth Church of England Primary. We work with a range of external providers, such as Sustrans and the Isle of Wight Council, to keep up-to-date with any appropriate schemes or grants that help us deliver this policy. The school is served by a Southern Vectis Bus that passes the school. Parents who bring and collect children by car can use the main public car park adjacent to the school in Tennyson Road. There is a permit scheme in operation with the council, so parents are able to use the car park free of charge for up to half an hour during the beginning and end of the school day – and also at lunchtimes for preschool parents. We are very lucky to have such a facility, so parents are asked to ensure that they use the marked parking bays to ensure that their children are safe when using the car park. Cars parked outside the designated areas are likely to incur a penalty notice. Parking Yarmouth Town Council have brought to our attention that people are parking their cars on the grass verge outside the school gates. This area does not belong to the school and is maintained by Yarmouth Town Council. Damage to this area will cost the Town Council considerably, please DO NOT PARK on the grass verge. Many thanks. Parents are asked not to park in the school car park or on the double yellow lines across in Mill Road, as this endangers the children. The local Traffic Warden patrols the area and gives parking tickets when necessary. Children will be released to a collecting adult at the end of the school day in the playground. Parents are responsi-ble for the safe conduct of their child when they leave the school premises at 3.00pm. We ask parents not to walk through the school car park. The school requires parents to inform us if their child is being collected by another adult. A sheet to inform us can be found at the School Office. The school also hold Walk to School Days and Bike to School Week. Please do not park in the small school car park as space is restricted and reserved for staff.